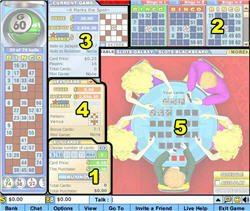 Leap Frog software offers an amazing 3D environment with several bingo halls and a ‘bar’ area. You can actually see yourself moving around and create your own appearance. Once in the bingo areas players sit in groups around tables and chat much as you would in a real bingo hall. The well-designed chat features include the option to set up your own shortcuts. There is also a private chat function and useful ‘message board’ where you can leave notes for friends. The software is download only. Comments & Feedback on "Leap Frog Bingo Review"